Aim: Environmental carcinogenic substances contribute to increasing incidence of hepatocellular carcinoma (HCC). We employed a sensitive method for the detection of DNA damage combined with analysis of the immune response to gain better knowledge how environmental carcinogens mediate pathology. Materials and Methods: Rat hepatocytes were isolated and stimulated with carcinogenic substances for the assessment of DNA damage. The mycotoxin aflatoxin B1(AFB1), two heterocyclic amines from the cooking of meat amino-3-methylimidazo[4,5-f] quinoline (IQ) and 3-amino-1-methyl-5H-pyrido-(4,3-b)-indole (TRP-P-2), and protein extract from the fungus Lactarius necator were assayed. Unscheduled DNA synthesis in hepatocytes was measured by the incorporation of radioactive thymidine during DNA repair. Stimulation of hepatocyte/immune cell preparation with the substances and measurement of IFNγ release at different time points determined their ability to induce an inflammatory response. Results: DNA repair in the hepatocytes was induced in response to 10−7 M AFB1 and 10−9 M IQ. TRP-P-2 did not induce DNA repair; however, at 10−4 M, the fungus extract did this. Furthermore, liver-resident immune cells responded with differential production of IFNγ over time in response to stimulation by all the carcinogens, with AFB1 being the most potent. TRP-P-2 showed the most significant reduction in IFNγ response over time. Conclusion: DNA damage in hepatocytes induced by environmental substances was detected at low molecular concentrations. The system did provide novel evidence for hepatic carcinogenicity by the fungus L. necator. Analysis of the response by liver-resident immune cells to the substances suggested that highly mutagenic substances induce prolonged inflammatory response. Abbreviations used: HCC: Hepatocellular carcinoma, AFB1: Aflatoxin B1, IQ: Amino-3-methylimidazo[4,5-f] quinoline, TRP-P-2: 3-amino-1-methyl-5H-pyrido-(4,3-b)-indole, UDS: Unscheduled DNA synthesis, EGTA: Ethylene glycol-bis-(2-aminoethyl ether) N-N-N'-N'-tetraacetic acid, WME: Williams' medium E, 2-AAF: 2-Acetylaminofluorene, HBSS: Hanks' balanced salt solution, CYPs: Cytochrome p450 enzymes. 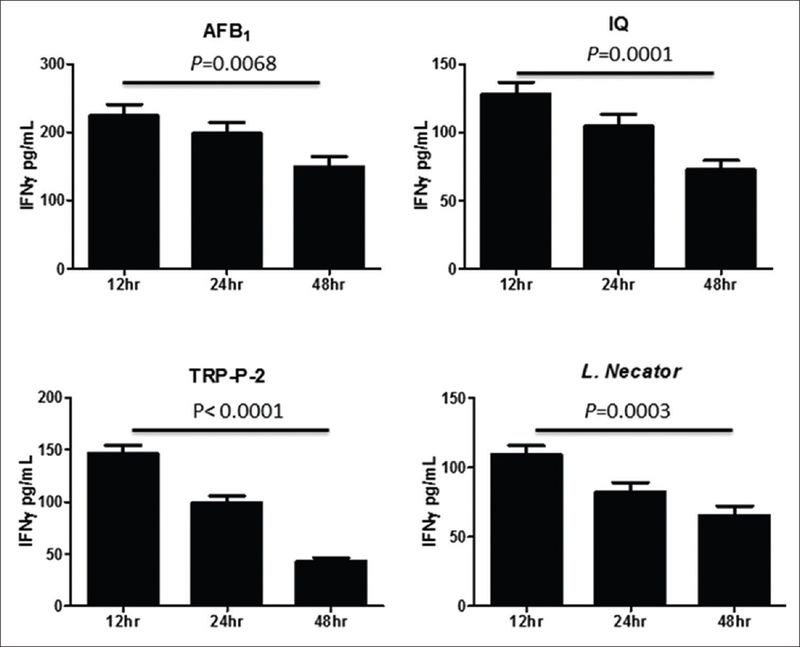 The mutagenic substances AFB1, IQ, and L. necator extract did induce more prolonged immune response than TRP-P-2. Hepatocellular carcinoma (HCC) is the third leading cause of cancer-related death. HCC occurs worldwide but is more frequent in developing countries than in industrialized countries. A number of risk factors are associated with HCC including hepatitis B and C virus infections, dietary intake of natural and artificial toxic substances, excessive alcohol consumption, and iron overload., As the liver is detoxifying substances that have entered the bloodstream, it is exposed to their toxicity. Carcinogenic substances include those that are present naturally and those that are by-products of food preparation. The fungus Aspergillus derived aflatoxin B1(AFB1) is an example of such a substance. The urinary excretion of aflatoxin metabolites due to food contamination was in East Asia associated with a 4-fold increase in HCC. Other examples of carcinogenic substances are heterocyclic amines developing during food preparation, such as 2-amino-3-methylimidazo [4,5-f] quinoline (IQ) and 3-amino-1-methyl-5H-pyrido-(4,3-b)-indole (TRP-P-2)., Furthermore, edible mushrooms such Lactarius necator have been reported to contain carcinogenic substances. In this study, we assessed UDS in hepatocyte preparations to assay naturally occurring mutagens. The substances were also analyzed for their ability to induce hepatic immune response in vitro. Collagenase 1A, ethylene glycol-bis-(2-aminoethyl ether) N-N-N'-N'-tetraacetic acid (EGTA), trisodium citrate-2-hydrate, Williams' medium E (WME), Harris' hematoxylin and eosin (H and E), permount, 2-acetylaminofluorene (2-AAF), AFB1, and TRP-P-2 were purchased from Sigma-Aldrich. Fetal bovine serum, gentamycin, Hanks' balanced salt solution (HBSS), and HEPES were purchased from Merck. (3H) thymidine ([3H] dT) was from PerkinElmer. IQ was from the Royal Society of Chemistry Worldwide Ltd. (Germany). L. necator was purchased from MycoBank, CBS-KNAW Fungal Biodiversity Center (The Netherlands) and IFNγ Elisa was purchased from Abcam. NTB-2 film emulsion, Kodafix, and D-19 developer were from Kodak. A fan was used to dry preparation of conserved fungus L. necator. Fungus extracts were homogenized and stored at room temperature until analysis. On analysis, the extracts were reconstituted using water. Protein concentration was determined using Bradford assay (Bio-Rad). The study was performed in the College of Medical Veterinary Animal House under standard laboratory conditions, 12:12 light/dark photoperiod at 23°C ± 2°C. Twenty male Sprague–Dawley rats at 6–8 weeks of age, at a weight of 200 to 280 g were used in the study (Anticimex, Sweden). The rats were housed in polystyrene plastic cages. Approval of the study was received from the Ethics Board and the Office of the Vice President for Scientific Affairs and Postgraduate Studies at the University of Sulaimani. In some experiments, rats were injected with 0.5 mg/0.1 ml saline, TRP-P-2 daily for a period of 6 days. Livers were subsequently removed and snap-frozen in liquid nitrogen. Frozen hepatic tissue was sectioned using a microtome, mounted on glass slides, fixed in 15% neutralized formalin, and subsequently stained with Harris's H and E as described below. Hepatocytes were prepared using 200 g male rats, as described earlier.,, The rats were anesthetized using pentobarbital at 50–75 mg/kg body weight intraperitoneal (i.p). A ventral midline incision was made from the xiphisternum to the pubic bone. The exposed liver lobes were carefully lifted, and a loose tie placed around the infra-hepatic inferior vena cava and another tie placed around the portal vein. A 21-gauge needle was inserted into the portal vein right which was ligated to ensure stability. Perfusion was commenced using a sterile solution (0.5 mM EGTA in Ca2+, Mg2+ free HBSS, 10 mM HEPES, pH 7.35; Solution I) at 37°C. The perfusion rate was maintained for 1.5 min at 8 ml/min. Immediately following the start of perfusion, the subhepatic inferior vena cava was severed to permit the perfusate to escape. During the perfusion, the thoracic inferior vena cava was cannulated by puncturing the right atrium and the perfusate was collected. Ligation of the proximal segment of the subhepatic inferior vena cava was completed and the pump speed was increased to 40 ml/min for 2.5 min. After completion of perfusion, 250 ml of a second sterile solution (100 units/ml type 1A collagens in WME buffered with 10 HEPES, pH 7.35; Solution II) at 37°C was perfused through the liver at 20 ml/min. During this perfusion, the liver was covered with a sterile gauge (gauze) and a heat lamp (300 W) was positioned 55 cm above the rat to maintain 37°C. After completion of perfusion, the liver was placed in a sterile Petri dish containing WME and was trimmed of extraneous fat and connective tissue (37°C). The liver was then transferred to a new Petri dish containing Solution II. The porta hepatis was grasped with forceps and the capsule of the liver was opened at numerous points on both the inferior and superior surfaces using small scissors. Cells were detached by gentle combing with a round tooth stainless steel comb. The hepatic cells were resuspended and passed through a wide-bore pipette a couple of times to separate cell aggregates. The suspension was transferred to a 50-ml centrifuge tube and the volume was brought to 50 ml with WME supplemented with 10% calf serum and 50 g/ml gentamycin (WMES). The cells were sedimented at 50 ×g for 5 min and resuspended in WMES, up to 15–25 ml in the centrifuge tube. Viability and cell recovery were assessed using trypan blue staining and counting using a hemocytometer. This perfusion gave a yield of 15–20 × 106 hepatic cells/100 g body weight with a viability of 85%. Suspensions with 5 × 105 cells/ml in WMES were immediately seeded onto 25-mm round thermanox coverslips in 35-mm six well dishes (Merck) containing a final volume of 2.5 ml of WMES. The plates were either used directly for the assessment of hepatocytes in combination with immune cells or were placed in a 5% CO2, 37°C incubator for 2 h. After the incubation, the medium was removed and the coverslips were washed with 2 ml of WME, leaving only the attached viable hepatocytes. These slides were subjected to DNA repair analysis in response to environmental toxins. DNA repair analysis was performed as previously described., The substances to analyze 2-AAF, AFB1, IQ, TRP-P-2, and L. necator extract were dissolved in either EtOH or DMSO and 2 ml of serum-free WME, containing 10 Ci/ml (3H) dT and were subjected to serial dilutions. Included were a positive control (2-AAF), a solvent control, and untreated cell. The hepatocytes were incubated with substances and (3H) dT at 37°C for 18–20 h. Each coverslip was washed five times in each of three successive dishes, filled with 100 ml phosphate-buffered saline pH 7.35. The coverslips were then placed in a clean 6-well dish and covered with 2 ml of 1% sodium citrate. This treatment resulted in swollen nuclei, permitting better quantification of the nuclear grains. The cells were then fixed using three changes of ethanol-glacial acetic acid (3:1), air-dried, and mounted cell-surface up, on glass slides with paramount. In darkness, slides were submerged in a prewarmed NTB-2 emulsion for 30 min at 45°C and removed and left to dry overnight. The slides were stored in the dark at 4°C. After 7 days of exposure, the slides were developed using D-19 developer for 4 min, placed in a stop bath of acidified tap water for 30 s, immersed in Kodafix for 10 min, washed in tap water for 5 min, and left to dry. The level of DNA repair in the hepatocyte cultures induced by a mutagenic substance was quantified by determining the net increase in nuclear grains. Grains were counted using a microscope at ×1200. Only cells, which were viable at the time of fixation, indicated by swollen nuclei and evenly coated with emulsion, were scored. About 20 cells, randomly selected from the coverslip, were counted. Counts were obtained for each nucleus while the background was determined by a nuclear-sized area of cytoplasm. Net nuclear grain counts were calculated by subtracting the highest cytoplasmic count from the nuclear count. This scoring method was designed to avoid false-positive results. Results of individual experiments were reported as the mean ± standard deviation of net gain counts for triplicate coverslips. A test substance was reported as positive when it produced a statistically significant increase in nuclear grains when using the one-tailed Mann–Whitney U-test. Cytotoxicity of the test substance was identified by the complete absence of S-phase cells in the autoradiograph and by general morphology. The substance was reported negative in this assay if the net nuclear count was not significantly increased at the highest nontoxic dose or at all concentrations up to the limit of solubility. Slides were stained with Harris' hematoxylin for 3–10 min and rinsed with tap water for 5 min. The slide was then submerged in ammonia water (2–3 ml concentrated ammonium hydroxide per 1000 ml H2O), rinsed in tap water, treated with 70% ethanol, and stained with eosin S (1%) for 60 s. The slides were then washed by immersion in 95% EtOH (3 × 2 min) followed immersion in 99.5% EtOH (3 × 2 min). Subsequently the slides were left to dry. The coverslips were mounted onto glass slides with mounting medium and assessed using a light microscope (Leica). Images were captured with a digital imaging system (Kodak). Liver cell preparations, placed on coverslips in six-well plates, were treated with 1.5 × 10−3 M each of 2-AAF, AFB1, IQ, TRP-P-2, or L. necator protein extract. Culture supernatants were removed at 12, 24, and 48 h after start of treatment and centrifuged to remove residual cells. The level of IFNγ released was determined using ELISA according to the manufacturers' instructions (Abcam). Data were analyzed by one- or two-tailed Mann–Whitney U-test used as and where appropriate. Statistical calculations were performed using Stat view SE + Graphics software (GraphPad Software, Fay Avenue, Suite, La Jolla, CA 92037 USA). We exposed rat hepatocytes to naturally occurring toxic substances with the aim to study their DNA repair inducing ability as a marker of hepatocarcinogenic activity. Initially, to verify that our system was able to detect damage to DNA, the hepatocytes were exposed to 2-AAF at concentrations ranging from 10−6 to 10−9 M. 2-AAF is a carcinogenic and a mutagenic derivative of fluorine which is commonly used in the study of carcinogenesis. Our system relies on the measurement of the increase in the rate of alkaline elution of DNA which is a marker of UDS., Intranuclear grains counted correlate to radioactive thymidine incorporation during UDS. This is part of the excision repair process during removal of DNA adducts. The number of grains was compared to the number of grains present in cytoplasm, the latter reflecting background. 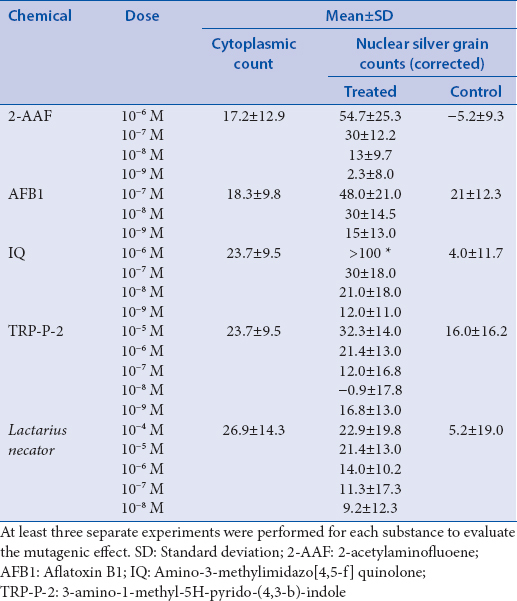 2-AAF was found to potently inducing DNA repair at a concentration as low as 10−9 M [Table 1]. The substance further showed a dose-dependent increase in DNA repair up to the 10−6 M level. The controls and the dose groups were compared using a one-tailed Mann–Whitney U-test. In all cases, a statistical difference at the 5% confidence interval was found, confirming statistically significant differences. Next, we exposed hepatocytes to the mycotoxin AFB1 which has a known association with HCC. The substance was used at concentrations ranging from 10−7 to 10−9 M. AFB1 was found to inducing UDS with activity detected at a concentration of 10−7 M [Table 1]. Interestingly, some chromosomes were very sensitive to the mutagenic effect of AFB1, while other chromosomes were resistant (data not shown). Heterocyclic amine derived during the preparation of red meat has also been reported to induce HCC.,, One of the metabolites IQ was evaluated and was shown to be highly mutagenic. Furthermore, for this substance, the DNA repair showed a dose–response profile (concentrations: 10−9–10−6 M), with mutagenic ability detected at concentrations of 10−9 M [Table 1]. We then assayed the heterocyclic aromatic amine TRP-P-2 also generated during preparation of meat. Contrasting to previous reports, we could detect only low levels of DNA repair in response to TRP-P-2 as grains in the nuclei could be seen only at the highest dose tested [10−5 M, [Table 1]. When the hepatocytes in our culture system were exposed to the amine, the substance induced vesicle formation in cells (data not shown). To verify the lack of DNA repair induction, we treated rats with i.p. injections of 0.5 mg TRP-P-2/day for 6 days and subsequently removed, sectioned, and stained livers with H and E. The morphological appearance showed several histological signs of liver injury, necrosis, vesicle containing cells, and invasion of neutrophils [Figure 1]. These changes were considered to be a drug-induced liver injury. The fungus L. necator is commonly consumed in the northern hemisphere. However, it has been found to contain a carcinogenic substance, necatorin. We prepared protein extracts from conserved fungi and assayed the mutagenicity of these in our system. A mutagenic effect was seen at a concentration of 10−4 M total protein used in the assay. Immune cells are present in the liver. These cells have been shown to be important in the induction of HCC, but persistent inflammation is also associated with better prognosis. We assessed the immune response to the genotoxic substances previously assessed for UDS, by exposing total liver cell preparations to these. For this, we used cell preparations containing nonadherent immune cells in addition to hepatocytes. The immune response was determined by measurement of IFNγ production by the cells at 12, 24, and 48 h of carcinogen exposure. After 12 h of incubation of the liver cells with 1.5 × 10−3 M of each substance, significantly increased production of IFNγ was measured compared to controls. AFB1 exposure resulted in the most pronounced immune response and release of IFNγ (223.9 ± 74.8 pg/mL) three-fold higher than control cells (66.3 ± 41.1 pg/mL, P < 0.0001). IQ, TRP-P-2, and L. necator protein extract exposure resulted in 127.4 ± 42.2 pg/mL (P = 0.0004, compared to controls), 146.7 ± 34.1 pg/mL (P < 0.0001), and 109.1 ± 29.6 pg/mL (P = 0.0032) release of IFNγ, respectively. The change in level of IFNγ release was assessed by comparing levels at 12 and 48 h [Figure 2]. Treatment with all substances resulted in a significant reduction of IFNγ production after 48 h stimulation, TRP-P-2 treatment showing the most significant reduction in cytokine release (3.4-fold, 146.7 ± 34.1 to 42.75 ± 15.64 pg/mL). In conclusion, we have been able to assess DNA repair induction/HCC inducing ability by several naturally occurring genotoxic substances. L. necator hepatocyte genotoxicity has not been reported before. In addition, we were able to detect substance-specific responses from the liver residing immune cells over time. The study suggests that persistent inflammation induction over time correlates with the substances mutagenic ability. In this study, we have used a sensitive system to assess naturally occurring substances ability to induce UDS in hepatocytes as a surrogate marker for initiation of HCC. Naturally occurring mutagens that are found in food could induce DNA damage in the hepatocytes at nanomolar concentrations. We were able to measure UDS induced by an extract from the fungus L. necator, which has not been reported before. By studying liver preparations containing resident immune cells, we were, in addition to DNA repair, able to assess the environmental toxins ability to induce substance-specific immune responses. The liver is a primary target for ingested naturally occurring toxins. These are there metabolized by CYPs. AFB1 is metabolized by the cytochrome enzymes CYP1A and CYP3A to exo-AFB1-8,9-epoxide. Unfortunately, this epoxide is highly reactive and genotoxic, covalently binding to nucleic acids in the nuclei of the hepatocytes forming adducts such as 8,9-dihydro-8 (N7 guanyl)-9-hydroxy-AFB1. Excision repair to remove adducts can introduce mutations in the DNA sequence. Such a mutation occurs for example often at 249ser in the p53 tumour-suppressor gene. This mutation has been observed in 30%–60% of HCC tumors in aflatoxin-endemic areas. Furthermore, intake of heterocyclic aromatic amines formed during meat preparation, IQ and TRP-P-2, has been shown to induce dose-dependent increase of DNA adducts and carcinogenesis in the liver.,, In our study, IQ induced DNA repair, but we were unable to replicate an induction of UDS by TRP-P-2. To verify the lack of mutagenicity by TRP-P-2, we assessed the compound in vivo and found liver damage but no signs of DNA repair. The intracellular vesicles found in the hepatocytes in response to treatment could be an early stage of apoptosis as has been described before. Necatorin from L. necator has previously been shown to be carcinogenic but not before to induce DNA repair in the liver. In this study, total protein extract of L. necator was used without exact knowledge of the concentration of necatorin in the preparation. However, DNA damage and mutagenesis alone is not sufficient for induction of hepatic carcinogenic. HCC does almost exclusively arise upon chronic hepatic inflammation. This, rather than a specific carcinogenic factor promotes a tumour-prone hepatic microenvironment. Paradoxically, an inflammatory environment is also associated with improved survival in hepatocellular carcinoma patients. NK and T cells have been identified in tumors of patients and their presence associated with longer survival. Furthermore, the time of establishment of a protective immune microenvironment is of importance. Early establishment during tumorigenesis has shown to impact disease progression significantly. IFNγ together with Toll-like receptor ligands stimulates cancer cells or macrophages to produce chemokines CXCL10, CCL5, and CCL2. These chemokines induce tumor infiltration by Th1, CD8+ T, and NK cells, leading to cancer cell killing and tumor control. IFNγ can also induce cell cycle arrest by direct binding to tumor cells. The importance of IFNγ to resolve HCC has been shown in a clinical trial where the cytokine with IL-2 in a combination of chemotherapy was shown to induce tumor regression in 70% of HCC patients. In the present study, we found that stimulation of hepatocyte preparations with all the environmental toxins induced IFNγ production by the resident lymphocytes, with AFB1 being the most potent. The different levels of IFNγ from the different substances at different time points suggest that they influence immune cells differently. Until now, studies of AFB1's influence on the immune system have shown variable results. Studies have often been performed in livestock to determine the role of AFB1 contamination in feed. Several studies have, unlike our findings, reported immune suppressive activity by the mycotoxin., However, it has also been reported that AFB1 influence blood cells are dependent of dosage. In agreement with our study AFB1 fed to swine increased the number of both monocytes and immune globulins in the blood. No reports have previously described the ability of IQ, TRP-P-2, and necatorin to induce an immune response in the liver. It has however been shown in mice that in an inflammatory environment (govern by the high level of IFNγ), IQ gained the ability to mutate DNA. The substance was nitrosylated by macrophages forming N-NO-IQ., Mediators of inflammation (i.e., myeloperoxidase, HOCl, and acid pH) can activate N-NO-IQ to forming DNA adducts. The environmental carcinogens induced the most IFNγ release from the hepatic immune cells after 12 h stimulation. IFNγ levels remained high after 48 h of stimulation with AFB1 and L Necator extract [Figure 2]. However TRP-P-2 that was in our system unable to induce mutagenesis showed the most reduction in IFNγ production after 48 h. Taken together, these findings support the notion that persistent inflammation is required for development of HCC. In the liver, IFNγ is produced by NK cells, NKT cells, and CD4+ and CD8+ T cells, so any these cells could have contributed to the cytokine release we detected. We speculate that persistent IFNγ release, induced by the environmental toxins assessed. serves as break preventing tumorigenesis in the liver. In support of this, IFNγ has previously been shown to prevent carcinogenesis induced by AFB1. Further studies are warranted to determining the specific effects of the carcinogenic toxins on individual liver resident lymphocyte subsets and possible dual role in both inducing and limiting carcinogenesis development. We have, in this manuscript, assessed mutagenic abilities of AFB1, IQ, and L. necator in hepatocytes. Such activity conferred by L. necator extract is described here for the first time. Such mutations are believed to be one of the events toward the development of HCC. Furthermore, stimulation of immune cells present in hepatocellular preparations with the substances in this study induced specific response in terms of IFNγ production. Prolonged IFNγ production was most evident for environmental substances able to induce mutagenesis. 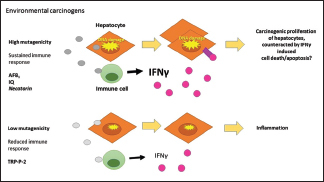 Given the role of IFNγ in limiting tumor development, we propose the induction of an immune cell-driven negative feedback response to the mutagens in the liver. We would like to thank Professor Dr. Christer Jansson (Departments of Respiratory Medicine and Allergology and Clinical Chemistry, Uppsala University Hospital, Uppsala University, Sweden), Professor Dr. Rizgar Mageed (Centre for Experimental Medicine and Rheumatology, QMUL, London, UK), and Dr. Richard Williams (Kennedy Institute of Rheumatology, Oxford University, Oxford, UK) for financial contributions. Support for this project was provided by the University of Sulaimani, College of Medicine, Sulaimani, Iraq, to Kawa Amin. Hamid AS, Tesfamariam IG, Zhang Y, Zhang ZG. Aflatoxin B1-induced hepatocellular carcinoma in developing countries: Geographical distribution, mechanism of action and prevention. Oncol Lett 2013;5:1087-92. Chen CJ, Yu MW, Liaw YF. Epidemiological characteristics and risk factors of hepatocellular carcinoma. J Gastroenterol Hepatol 1997;12:S294-308. Freedman ND, Cross AJ, McGlynn KA, Abnet CC, Park Y, Hollenbeck AR, et al. Association of meat and fat intake with liver disease and hepatocellular carcinoma in the NIH-AARP cohort. J Natl Cancer Inst 2010;102:1354-65. Gallagher EP, Kunze KL, Stapleton PL, Eaton DL. The kinetics of aflatoxin B1 oxidation by human cDNA-expressed and human liver microsomal cytochromes P450 1A2 and 3A4. Toxicol Appl Pharmacol 1996;141:595-606. McGlynn KA, Tsao L, Hsing AW, Devesa SS, Fraumeni JF Jr. International trends and patterns of primary liver cancer. Int J Cancer 2001;94:290-6. Ashida H, Shiotani B, Adachi H, Hashimoto T, Kanazawa K, Danno G, et al. Tryptophan pyrolysis products, trp-P-1 and trp-P-2 induce apoptosis in primary cultured rat hepatocytes. Biosci Biotechnol Biochem 1998;62:2283-7. Pais P, Salmon CP, Knize MG, Felton JS. Formation of mutagenic/carcinogenic heterocyclic amines in dry-heated model systems, meats, and meat drippings. J Agric Food Chem 1999;47:1098-108.
von Wright A, Suortti T. Preliminary characterization of the mutagenic properties of ‘necatorin’, a strongly mutagenic compound of the mushroom lactarius necator. Mutat Res 1983;121:103-6. Rasmussen RE, Painter RB. Evidence for repair of ultra-violet damaged deoxyribonucleic acid in cultured mammalian cells. Nature 1964;203:1360-2. Djordjevic B, Tolmach LJ. Responses of synchronous populations of heLa cells to ultraviolet irradiation at selected stages of the generation cycle. Radiat Res 1967;32:327-46. Racanelli V, Rehermann B. The liver as an immunological organ. Hepatology 2006;43:S54-62. Chew V, Tow C, Teo M, Wong HL, Chan J, Gehring A, et al. Inflammatory tumour microenvironment is associated with superior survival in hepatocellular carcinoma patients. J Hepatol 2010;52:370-9. Schneider C, Teufel A, Yevsa T, Staib F, Hohmeyer A, Walenda G, et al. Adaptive immunity suppresses formation and progression of diethylnitrosamine-induced liver cancer. Gut 2012;61:1733-43. Bakheet SA, Attia SM, Alwetaid MY, Ansari MA, Zoheir KM, Nadeem A, et al. B-1,3-glucan reverses aflatoxin B1-mediated suppression of immune responses in mice. Life Sci 2016;152:1-3. Marin DE, Taranu I, Bunaciu RP, Pascale F, Tudor DS, Avram N, et al. Changes in performance, blood parameters, humoral and cellular immune responses in weanling piglets exposed to low doses of aflatoxin. J Anim Sci 2002;80:1250-7. Lakshmi VM, Hsu FF, Zenser TV. Nitrosation and nitration of 2-amino-3-methylimidazo[4,5-f] quinoline by reactive nitrogen oxygen species. Chem Res Toxicol 2002;15:1059-68. Dean S. Measurement of unscheduled DNA synthesis in vitro using primary rat hepatocyte cultures. Methods Mol Biol 1995;43:267-76. Williams GM. Further improvements in the hepatocyte primary culture DNA repair test for carcinogens: Detection of carcinogenic biphenyl derivatives. Cancer Lett 1978;4:69-75. Working PK, Doolittle DJ, Smith-Oliver T, White RD, Butterworth BE. Unscheduled DNA synthesis in rat tracheal epithelial cells, hepatocytes and spermatocytes following exposure to methyl chloride in vitro and in vivo. Mutat Res 1986;162:219-24. Williams GM, Bermudez E, Scaramuzzino D. Rat hepatocyte primary cell cultures. III. Improved dissociation and attachment techniques and the enhancement of survival by culture medium. In Vitro 1977;13:809-17. Logan CM, Rice MK. Logan's Medical and Scientific Abbreviations. Philadelphia: J. B. Lippincott Company; 1987. Howes AJ, Beamand JA, Rowland IR. Induction of unscheduled DNA synthesis in rat and hamster hepatocytes by cooked food mutagens. Food Chem Toxicol 1986;24:383-7. Saito J, Fukushima H, Nagase H. Inhibitory effect of magnolol on trp-P-2-induced DNA damage in various organs in mice. Phytother Res 2009;23:901-5. Møller P, Wallin H, Vogel U, Autrup H, Risom L, Hald MT, et al. Mutagenicity of 2-amino-3-methylimidazo[4,5-f] quinoline in colon and liver of big blue rats: Role of DNA adducts, strand breaks, DNA repair and oxidative stress. Carcinogenesis 2002;23:1379-85. Chew V, Chen J, Lee D, Loh E, Lee J, Lim KH, et al. Chemokine-driven lymphocyte infiltration: An early intratumoural event determining long-term survival in resectable hepatocellular carcinoma. Gut 2012;61:427-38. Braumüller H, Wieder T, Brenner E, Aßmann S, Hahn M, Alkhaled M, et al. T-helper-1-cell cytokines drive cancer into senescence. Nature 2013;494:361-5. Lygidakis NJ, Kosmidis P, Ziras N, Parissis J, Kyparidou E. Combined transarterial targeting locoregional immunotherapy-chemotherapy for patients with unresectable hepatocellular carcinoma: A new alternative for an old problem. J Interferon Cytokine Res 1995;15:467-72. Chen K, Yuan S, Chen J, Peng X, Wang F, Cui H, et al. Effects of sodium selenite on the decreased percentage of T cell subsets, contents of serum IL-2 and IFN-γ induced by aflatoxin B1 in broilers. Res Vet Sci 2013;95:143-5. Weaver AC, See MT, Hansen JA, Kim YB, De Souza AL, Middleton TF, et al. The use of feed additives to reduce the effects of aflatoxin and deoxynivalenol on pig growth, organ health and immune status during chronic exposure. Toxins (Basel) 2013;5:1261-81. Lakshmi VM, Clapper ML, Chang WC, Zenser TV. Hemin potentiates nitric oxide-mediated nitrosation of 2-amino-3-methylimidazo[4,5-f] quinoline (IQ) to 2-nitrosoamino-3-methylimidazo[4,5-f] quinoline. Chem Res Toxicol 2005;18:528-35. Reiners JJ Jr., Crowe D, McKeown C, Nerland DE, Sonnenfeld G. Gamma interferon induction depresses murine hepatic promutagen/procarcinogen activation. Carcinogenesis 1984;5:125-8.